Also see Cloudy Creek & Nolans Gully. You won't find Ethel Creek Falls listed on any of the National Park websites, nor will you find it on any of the signs in the area. That may change if Queensland's Department of National Parks take over the maintenance of the Paluma trails. Ethel Creek waterfall is a hidden gem in the middle of Paluma Range National Park and you're very likely to be the only ones there! Benham's Creek runs to the north of Paluma behind the Recreation Reserve and forms the southern boundary of Mt Spec National Park. This creek was originally called Ethel Creek by the Benham brothers. Later, a surveyor erroneously gave the name Ethel Creek to a larger stream that joins Benham's Creek further north. An official decision was made in 1939 to rename the original Ethel Creek as Benham's Creek - Paluma The First Eighty Years 1870s-1950s. 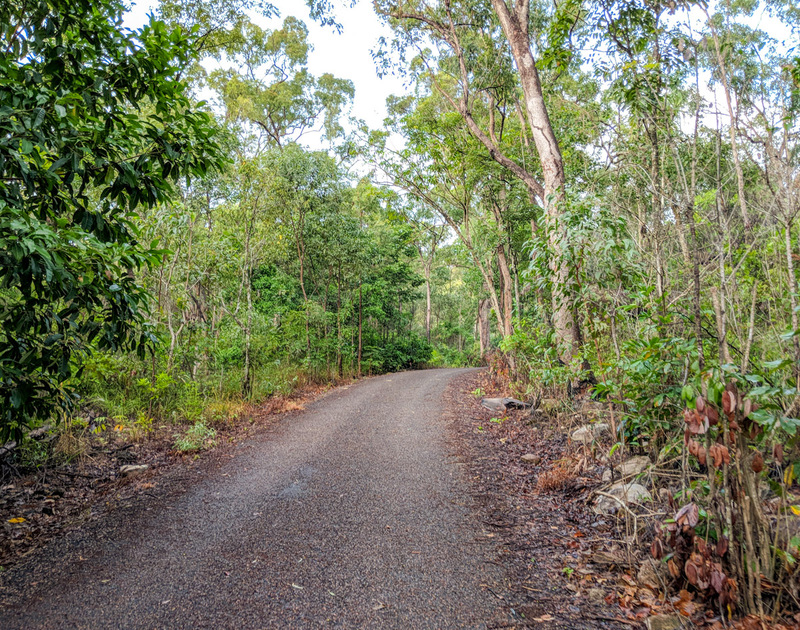 Today's Ethel Creek and Ethel Creek Falls are behind the acreages to the west of Paluma and are only accessible via the Paluma tracks or walking from mango tree car park. Ethel Creek flows into Crystal Creek. 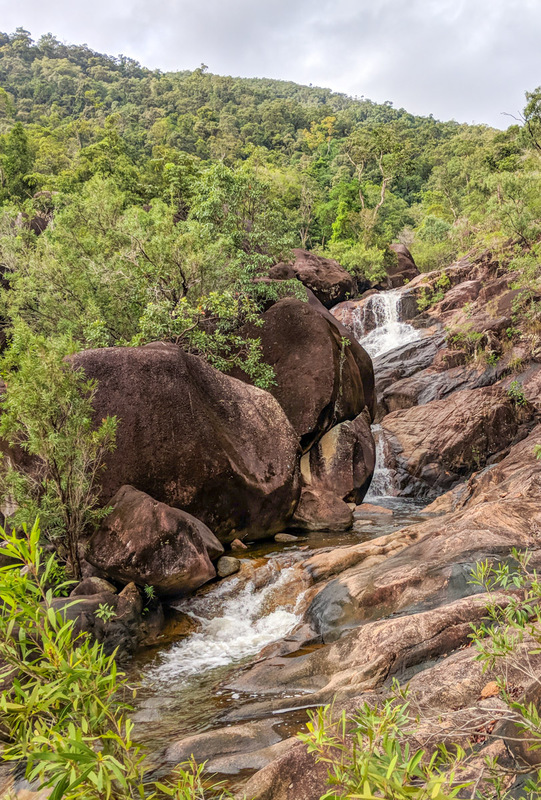 The track to Ethel Falls starts at Cloudy Creek Falls, which can be reached via a trail starting from McClellands Lookout at the Eastern edge of Paluma Township. The total distance cover will be 10km return. Once you reach Cloudy Creek Falls, you will notice two steel poles concreted into the ground for no apparent reason, a keen observer will see two more poles on the other side of the creek. These are the remains of an old suspension bridge, if you pick your way carefully across the creek you'll see the start of a track right where the two poles are. The track to Ethel Creek is much less defined than the Cloudy Creek track, but anyone with reasonable experience should have no trouble following it. There are also trail markers tied and nailed to tree trunks along the route if you're at all unsure and there are numbered markers at the major intersections as part of the larger trail network. Once you reach Ethel Creek, you'll find yourself at the top of the falls, if you cross the creek and follow the track to the right you'll find a steep climb down to the bottom of the falls, there's also a rope tied as a handrail most of the way down. The water hole at the bottom of the falls is big enough to swim in if you need to cool off before the return journey. Always take care when crossing creeks or climbing rocks in the rainforest, Paluma is one of those places that never really dries out and the rocks will always be wet and slippery. Whenever the undergrowth is wet, there will be leeches after you, apply some bug spray before you head off and after you swim. This trip is another cracking rock hop. It begins by walking along the water intake road at Big Crystal Creek; park your car at Mango Tree car park near the Nolan's Gully Rock Slides. Pass through the gate and continue along the Intake Rd until you reach a causeway (about half an hour); This is Ethel Creek. Don't go all the way to Crystal Creek Intake. From here, you will need to carefully rock hop your way up the creek to Ethel Creek Falls; Keep to the right fork to stay in Ethel Creek, avoiding Cloudy Creek. As with all rock hopping walks, you will step and jump from rock to rock, and scramble (i.e. climb hand over hand) for brief periods of time. Sometimes you may go out of the creek to get around an obstacle, but generally Ethel Creek is a fantastic creek that allows you to keep in there the whole time. You are guaranteed lovely waterfalls and fantastic swimming-holes along the way. Sometimes descending is a bit easier than going up the creek. Since Paluma Township above, I highly recommend sterilising the water in the creek before consuming. I would also recommend canceling your trip if rain is forecasted. Always take care when rock hopping and climbing rocks in the rainforest, Paluma is one of those places that never really dries out and the rocks will always be wet and slippery. Whenever the undergrowth is wet, there will be leeches after you, apply some instant repellent around your ankles before you head off and after you swim to help prevent leeches and ticks. There are no bolts at these falls. Just rappelling off the two trees off to the right hand side of the falls. The rappel is approximately 15m. Whatever clothing you feel able to move in. Some people wear long sleeved shirts, others don't; some wear long trousers and others shorts. It is up to you. Whatever you wear, you must be able to move easily - especially if rock hopping. Here's an interactive map of the tracks and circuit. Suggested route is up Ethel Creek and down Cloudy Creek or down Nolans Gully. Summiting Mt Halifax is a strenuous walk and you'll need to be fit to climb up some steep hill sections. The bush track is rough and uneven underfoot. Witts Lookout showcases a beautiful view over Nolans Gully and out to the ocean. Hiking down into the creek is very steep but you are rewarded with waterfalls, cliff jumps and perfect swimming holes.